Several folks had asked about ways they could wire some sensors or other components to tap into a grid of IXMs. So Chris and Paul worked with Dave to create the IXM Proto Cell. The IXM Proto Cell contains a broad, solderable dev area that’s perfect for building analog RC circuits, and could interface with analog through an analog to I2C converter. The IXM Proto has a dual 7-pin interface along one edge that connects directly into a single face of any other IXM cell. Each IXM digital pin is mapped out to a set of solder pads, and onboard 3.3V and 5V voltage regulators protect components from the IXM’s native 12V power rail. The remaining components equip the board for connecting circuits easily and driving outputs to the remainder of the IXM system. 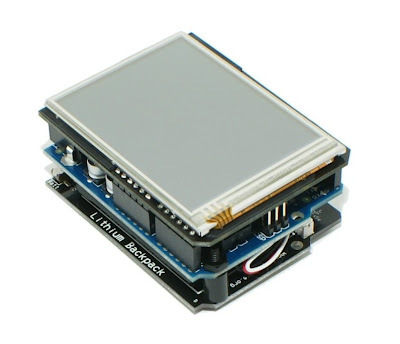 It’s also a handy debugger tool for reading out directly to various components, or to interface just about any part with the pins on an IXM cell – all within the same shape and form factor. One way to think about the IXM Proto is that it’s the “wildcard” in the ecosystem. Anything goes, kind of like a DIY IXM cell. The first is the BlackWidow, or as some would call it, a “WiFi Arudino”, which uses a surface mount Atmega328 to make room for an onboard 802.11b WiFi module. I know people have been talking about it for a while, and it’s pretty neat to find one for less than the Arduino BT. …the tennis courts at the Cambridge Rindge and Latin School. Maker Faire Boston was one of the main attractions at the kickoff to the Cambridge Science Festival, which the MIT Museum sponsors each year. I brought the Gravitational RC Driving by Arduino project that Chris and I did last month. With all the tents and people walking around, it wasn’t really a good idea to have the car flying around. So I had it propped up on a couple Fastenal catalogs that would let the wheels keep spinning. It was pretty neat to see kids getting into hardware and electronics so early, though. I certainly had no idea what an accelerometer or a touchscreen was when I was 7, but it seemed like they knew exactly what it was. I call it the “iPhone effect”, where everyone has a baseline understanding and expectation of how technology interacts with them, even if they can’t quite articulate it yet. 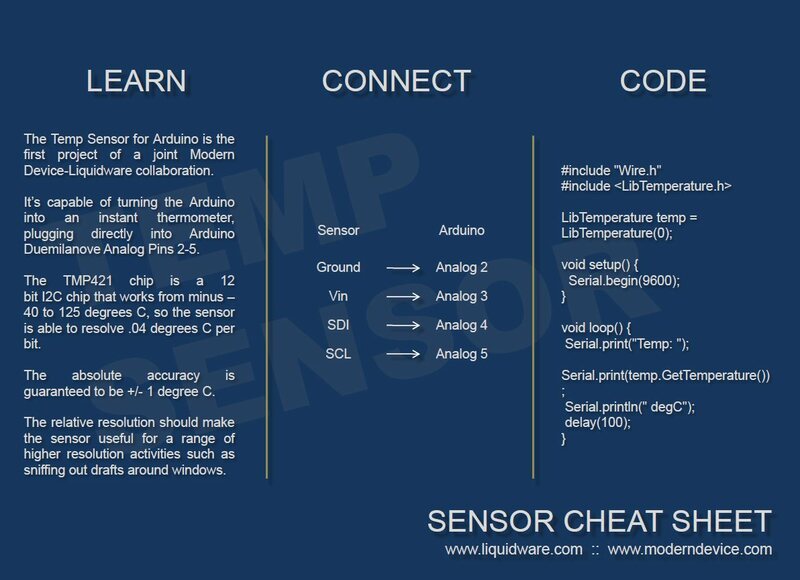 I found myself explaining what the Arduino was and how it was useful as a way to customize and rapidly prototype hardware really easily. 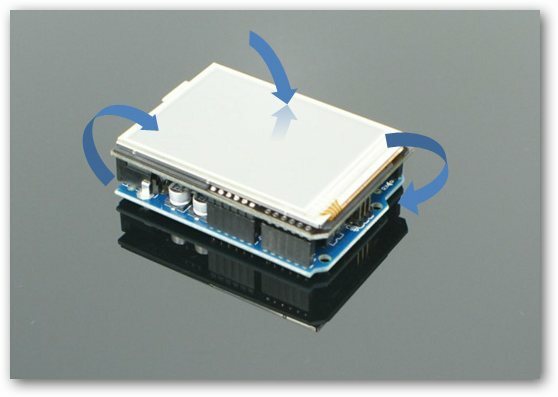 The Arduino/Processing language is straightforward, most shield-based hardware is modular and “soldering-optional”, and communicating with ICs over dedicated, enumerated pins makes complex development quite manageable. Mike and I also met a lot of interesting folks who work in the burgeoning Boston biotech scene. Some recognized the Arduino, but opted for embedded hardware with a little more horsepower like Gumstix and Beagleboard to do their prototyping. The Cambridge Mini Maker Faire turned out wonderfully, and I’ll definitely be stopping by the other events at the Cambridge Science Festival. A special thanks to Chris Connors and Ellen Bluestein for getting me set up, and everyone who volunteered and stopped by to say hi, or play with some hardware! I was browsing the CSAIL event calendar at MIT, and noticed that next Thursday, there's an event on "reality-mining". It sounded like a pretty catchy idea, and after doing some digging, I realized that the concept of reality mining has a lot to do with opening up transparency into digital data about social interactions, etc. BUT! In a general sense, it also has to do with the process of understanding "machine-sensed environmental data." Translation for mere mortals like me: "sensors"
The coolest part about reality-mining is the notion of visualizing the output of sensor type data in novel ways. 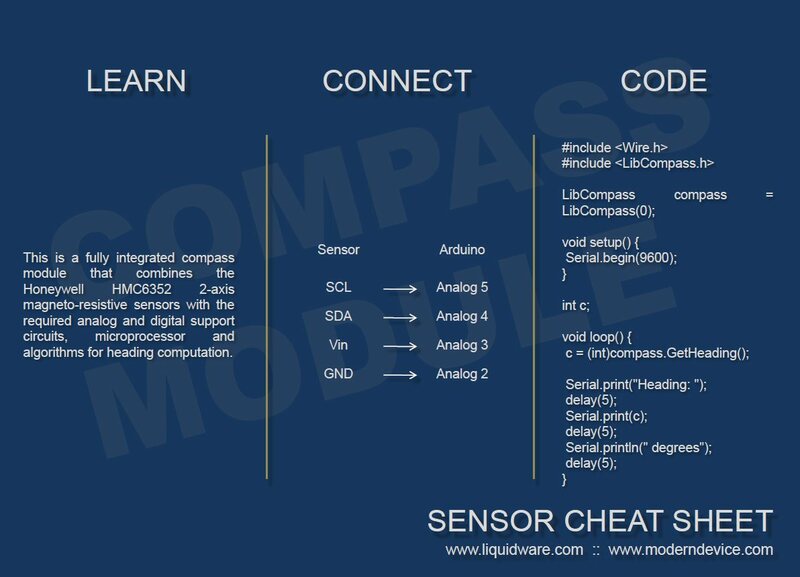 So I figured I'd apply that concept to the Modern Device / Liquidware sensors. 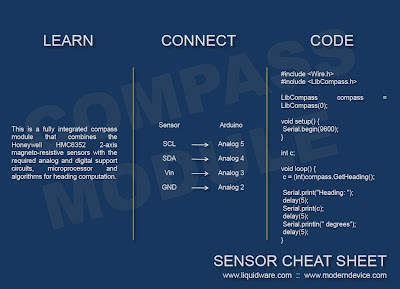 Starting with the Compass Sensor. The latest sensor in the Liquidware-Modern Device collaboration is the Ambient Light Sensor. Paul’s uploaded it over at Modern Device, and I’ve put it up on the Liquidware shop as well. In the spirit of being environmentally friendly, I’ve been trying to cut down on the amount of electricity I use. Well, the environment, and the fact that my electricity bill is really expensive. I try to make it a habit to turn off my lights whenever I’m not home, but I’ll forget from time to time, and it would be nice to know. Or to be able to somehow measure whether it’s already (quantitatively) bright enough in the room, and I can dim my lights accordingly. Something like a light meter is really ideal for it, because it could measure light accurately and automatically adjust brightness in my room, or let me shut it off if I find out that I’ve left the light on. Some phones already have this, and will dim the screen to conserve power in high ambient light. (Note: the pair of circles to the right are actually IR emitter-detectors that serve as proximity shut off the screen when the phone is held to the ear during a call – thanks Cyrozap!) With that in mind, AMBI, the ambient light sensor, came into being. The “AMBI” is a small board that carries a Sharp GA1A1S201WP surface-mount ambient light sensor. 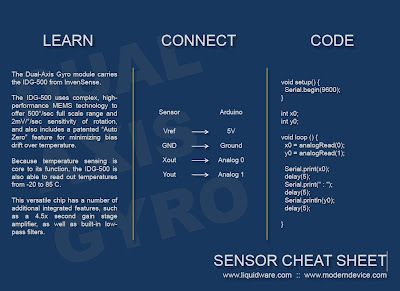 The light sensor has a spectral response similar to that of the human eye, which means the sensor is highly accurate when used as the basis of an ambient light sensor, or camera exposure sensor. It’s also capable of digitally quantifying the brightness of a wide range of ambient light (3 to 55000 lux) in a very small form factor setup. The AMBI's 3-pin interface mounts directly onto the analog pins on an Arduino, and tucked in really neatly under my TouchShield Slide. The three pins are Ground, +5V and readout, which makes it very simple to interface to the analog pins. I’ve uploaded the PDF cheatsheet to help get things going over here. Anyway, I’ve started working on a couple fun projects, and I’ll be posting them up as tutorials over the next few days. If you can beat my time, I will give the first 5 people who submit a video response to this video free sensors. My time on this video is 5 minutes and 38 seconds. -Beat my time by connecting 5 different types of sensors to the same Arduino one at a time. Only 1 Arduino Duemilanove or Diecimila. You can't pre-wire the sensors, you have to use them the way you got 'em. You can't use 5 of the same sensors. 4:00 - um maybe not possible? No negative times, no backwards running clocks, etc. Yes, obviously there are multiple per household. Whoever came up with "only 1 per household" seriously pissed me off as a kid. If I collected that many proof of purchases from cereal box tops, you owe me 2 GI Joe action figures, General Mills. I will never forget that. General Mills, you ruined my childhood. I hate contests. I really hate when companies run contests that are like, "WIN THIS FOR FREE AND SUBMIT THIS FORM AND WIN A TRIP TO HAWAII YAYAYAYAYAYAYA XOXOXOXOXOX". That's lame. I always feel manipulated, and the contest ends up feeling gimmicky and stupid. Why am I wasting my time doing all this work just for the company to profit off of me? Open Source Hardware and Physical Computing is done by people like me, DIY'ers who typically have day jobs, and do hobby projects at night and on weekends. I do my work in my own time, and I don't have time to fiddle around with spec sheets for hours just to get a sensor up and running. DIY projects live and die by the clock. I call it the Race Against the Physical Computing Clock. If there's a portion of the project that takes too long, or is too complex, or requires me to read a 15 page PDF specification sheet in order to figure it out, the project will die. I'm too darn lazy to read technical whitepaper spec sheets. I don't think I'm the only one, either. Paul and Chris shared my frustration, when it took us more than 19 minutes to get a sensor up and running that we had bought from Radio Shack. 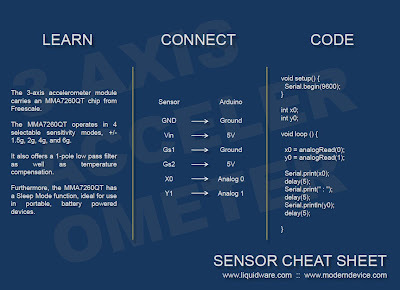 Apparently, someone at Radio Shack thinks it's an acceptable idea to sell sensors with bit timing diagrams and URL's where you have to download special drivers to get the sensor working. Are you kidding me? That kills the whole point of rapid prototyping DIY projects and physical computing. Tom Igoe once told me, physical computing is about being able to see inside the case, open the box, you don't own it if you can't see and tinker inside. He called this the "glass box" principle. I propose another principle: the "don't waste my time with spec sheets principle". 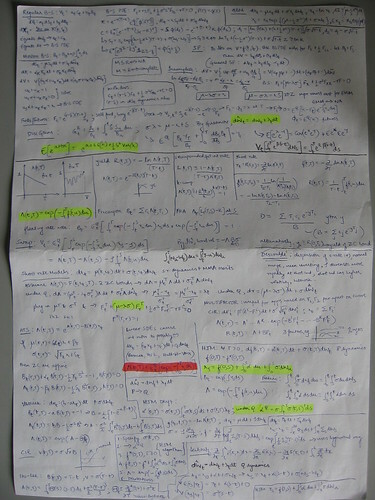 I'll shorten it to the "spec sheet" principle. No DIYer should ever need to understand digital signal multi-wire chip select timing diagrams in order to get a sensor up and running. Ever. Over my dead body. 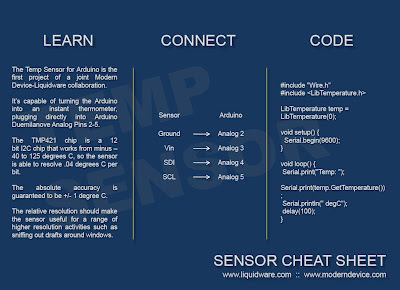 So Justin, Paul, Chris and I have made "sensor cheat sheets" and a new branch of the Arduino Antipasto IDE that reduce the amount of time required to get a given sensor up and running. 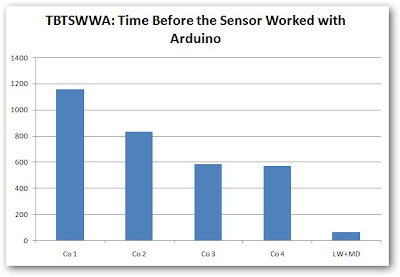 We thought about the process that we, and other people we know, used to get a sensor communicating with Arduino. 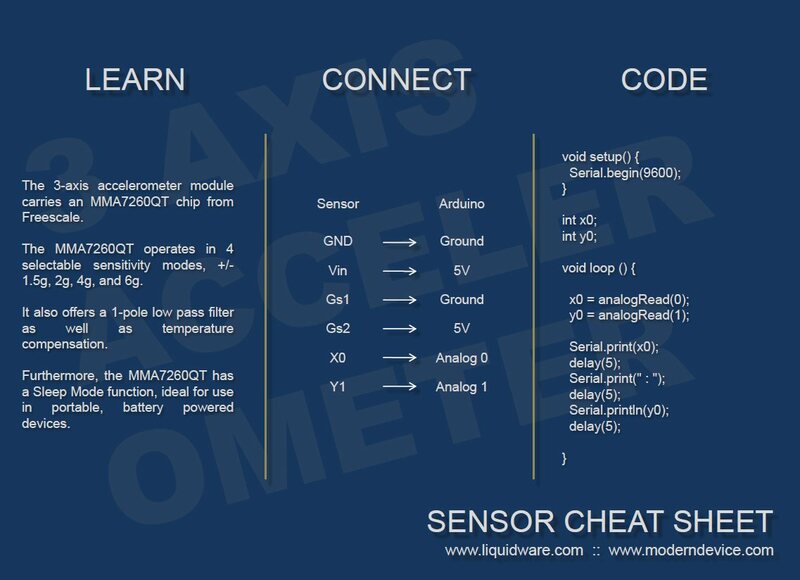 Here are our average results with 4 other commonly used accelerometer sensors, compared to the new Liquidware + Modern Device triple axis accelerometer. The y axis in the chart below is in seconds. The first sensor required soldering, and we had to assume that the soldering iron was warmed up. 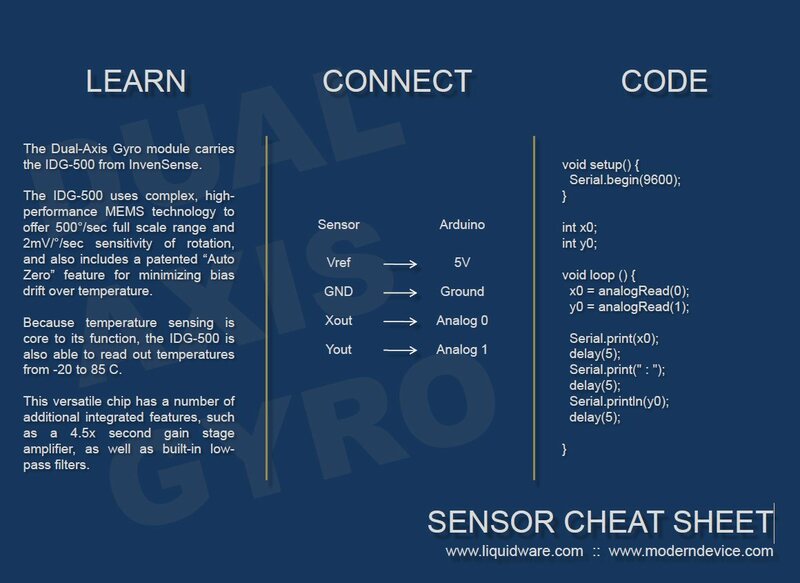 The next 3 sensors all required various degrees of hunting on the web for the source code that someone else had written for the sensor. That typically meant searching the Arduino forums or playground. 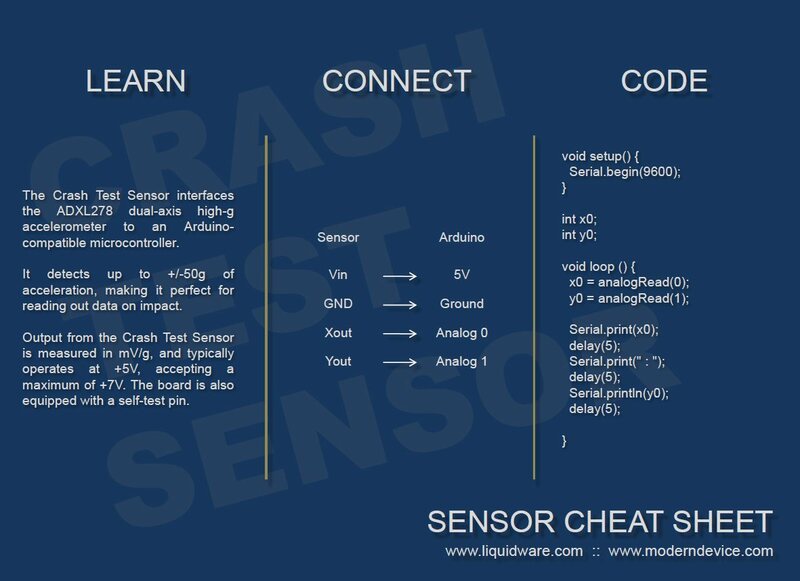 Here are the pdfs (PDF ALERT) for the sensor cheat sheets, and here are the picture samples below: crash test sensor, 3-axis accelerometer, temp sensor, compass sensor, dual axis gyroscope. 3 months ago, Paul from Modern Device, Chris from Liquidware, and I sat down at coffee in New Haven with a bunch of Arduinos and sensors from Sparkfun, Parallax, Radio Shack, Digikey, and Jameco and started hacking together some small fun projects using the sensors to measure the positions of our limbs and 3D objects. 1 isn't hard to get, you can get sensors for all over the place. 2 isn't bad either, since Nate at Sparkfun does a really nice job with his breakout boards. But 3 is usually buried deep inside a PDF spec sheet written in China that usually looks a lot like the most technical thing you've ever seen. And 4 is a crapshot, and you have to cross your fingers and pray that someone else has ported the code. So we figured that had to be a better way to do physical computing with sensors. We promised ourselves we would spend the next 3 months achieving an "order of magnitude increase in time-based productivity with DIY physical computing sensors". And this is the result of that work. Whenever I bought hardware in the past, I would do one of two things: a) rely on my intuition to figure it all out, or b) look for a quick start guide to get me going. Option A only worked about 35% of the time for me, but I suspect that most DIYers actually fare rather well with it, and perhaps it works 60 or 70% of the time. Even so, Option B was never a bad thing to have. 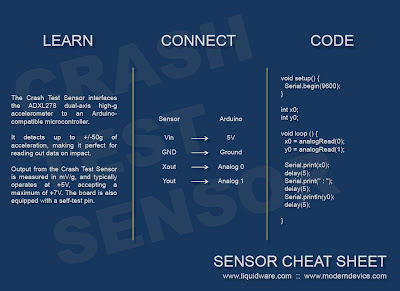 It was with that concept in mind that Matt and I wrote up the Sensor Cheatsheets. But from a ground level, something was still missing. In other words, if I had no idea what kind of hardware I just picked up, what do I do? -How do I use Arduino with these shields and sensors? -How do I program the TouchShield Slide? -How do I upload images to the Slide? Several folks have been asking for a few features in the Antipasto IDE that bring some enhancements to the standard Arduino and Processing interface. Many an IDE generation (and update) later, Chris and I sat down, and decided it was time to roll up our sleeves and do some spring cleaning. Based on a lot of the comments he and I received, some things were working better than others, and some new features were really becoming popular and needed to be integrated. 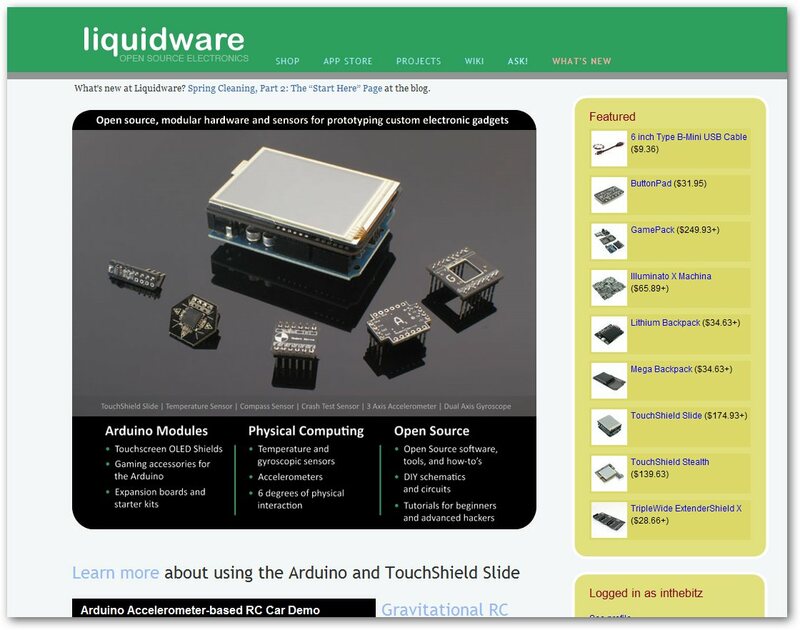 I’ve also created a dedicated download page hosted on the Liquidware website just for the Antipasto Arduino IDE. All future updates will be shared here, so there will be no need to look elsewhere or get mixed up with an older version. After a few revisions of the Arduino and Processing IDEs, it was time to sync up on some bug fixes, and bring Antipasto’s enhancements to an interface more in line with what most folks were used to. This is one I personally had trouble with. When I decided to cross the great “4 gigabytes of RAM” divide, I knew it was time to upgrade to 64-bit. I also heard some decent things about Windows 7, like “At least it’s not Vista”, so I decided to give it a try. But Windows 7 64-bit broke my Antipasto and Arduino IDE for some time, and I was running the IDE off an old laptop. In the spirit of streamlining the latest Antipasto, Chris took out the gadget panel and *.gdt support. However, the extended reference panel is still included, and library/sample sketch selection adjusts automatically depending on the board selected. Some people who bought the Navigation Rig were using the accelerometer to interface with the TouchShield Slide. After a bit of coding, they suggested that it might make sense to have a library built in to make visualizing sensor data on the Slide quicker and easier. This is another feature that’s been sitting on the to-do list, since image uploading is a critical function for most Slide users. Anyway, it’s now integrated with an example sketch. The Image Uploader’s drag-and-drop functionality is built into the Antipasto interface, and works nicely with the Slide.